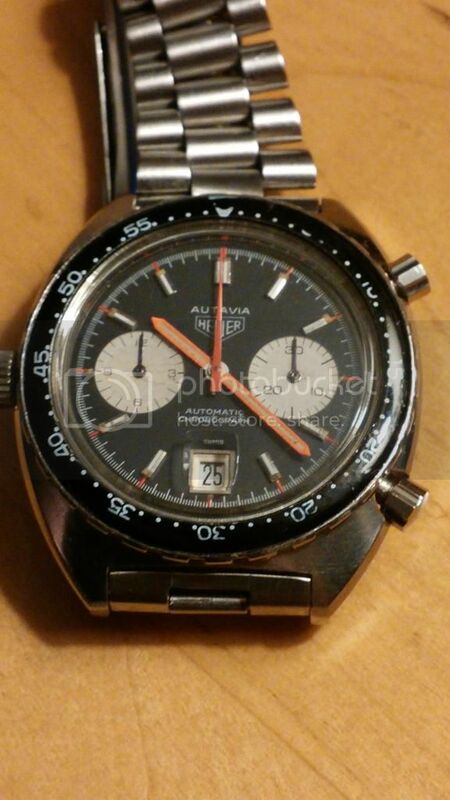 1969 Heuer Autavia 1163MH Automatic Chronograph. The hour and minute hands on this watch are unfortunately incorrect. On March 3, 1969 the Chronomatic group held a press conference in Geneva Switzerland and New York City to publicly announce the creation of automatic chronographs with the caliber 11 movement. At the 1969 Basel Fair in April the Chronomatic group showed 100 pre-production prototypes of Heuer and Breitling chronographs to attendees and after the show they distributed the watches to their most important distributors. Heuer chronographs with the caliber 11 in them were available to consumers worldwide in August of 1969. Early caliber 11 chronographs were known to suffer from over-banking of the balance. Heuer responded to problems in early watches by creating a modification to these calibers which addressed the problem. Caliber 11s modified to fix the problem have an “i” stamped on them next to the Cal. 11 designation under the balance and in 1970, Heuer introduced the caliber 12 which incorporated the modification into production. This watch was produced in 1969. It was one of the first models Seiko produced with their new 6139 chronograph movement. The second sweep and minute totalizer hand on this watch are incorrect, the dial bezels for the day/date apertures are incorrect and the internal bezel ring doesn’t appear original. The watch case is correctly notched by the crown and the movement is the 6139A 21 jewel version found in these watches till early 1970. The 6139A movement, notched case and Speed Timer and Sports 5 labeling of this watch are the hallmarks of earliest Asian market versions. 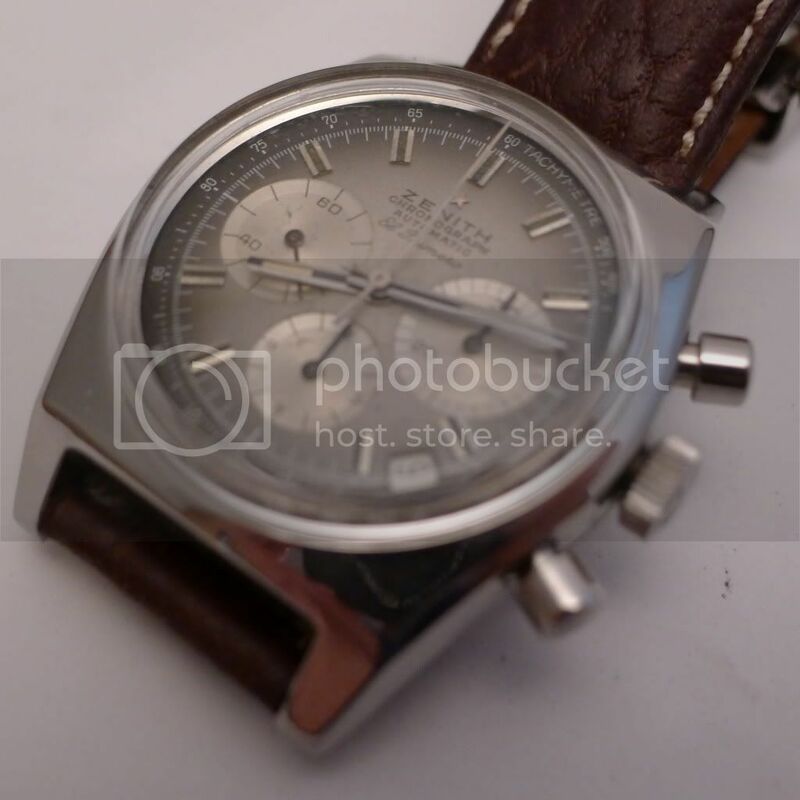 Unlike Zenith and Heuer, the only proof of Seiko’s creation of an automatic chronograph in 1969 was their production, since Seiko never held a press conference or announced their achievement. Based on decoding of serial numbers of watches in the hands of collectors (1st digit of Seiko serial numbers indicate year of production, 2nd digit indicates month of production), it appears Seiko was in full serial production of 6139s in February of 1969. Based on the serial number of this watch, it would appear they produced over 8000 watches in February. 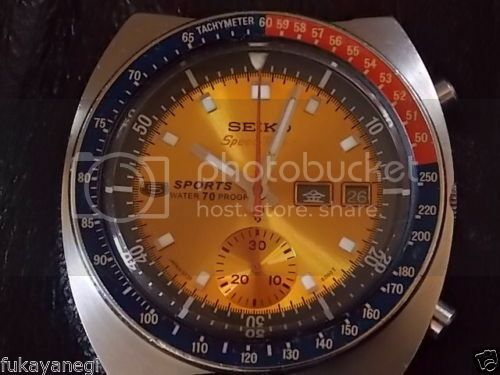 Seiko began retail sales of 6139 chronographs in the Japan in May of 1969. Zenith held a press conference on January 10, 1969 announced their creation and showed working prototypes . It took till October of 1969 for El Primero watches to become available to consumers at retailers.